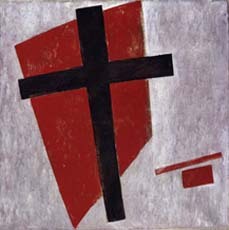 Russian Avant-garde is a revolutionary art movement which occured in the first decade of 20th century. A century on, this extraordinary facet of Russian cultural legacy continues to fascinate people. Creative innovation, daring attitude, intellectual intensity and deep emotionality – those are what brought the movement to international renown and it had a great impact on 20th century art. 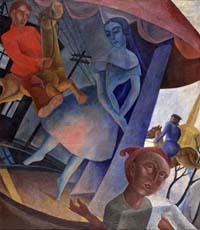 This exhibition focuses upon the “springtime” or early stage of the Russian Avant-garde and it includes 70 works by 30 artists (mainly oil paintings except for 2 bronze sculptures) of well-known Russian artists like Kazimir Malevich, Natalia Goncharova, Mikhail Larionov, Aristarkh Lentulov, Vladimir Tatlin, and Pavel Filonov for the sculptures. Many pieces of these collections were returned to Russia from abroad by the museum’s founder and General Director Zurab Tsereteli. 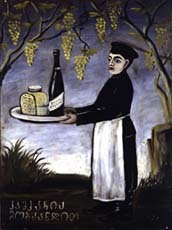 One of the highlights of this exhibition is its wide range of collection of Niko Pirosmani ; a Georgean self-educated primitive artist who drew many paintings for pub signs in order to earn the least money for living. His rustic and primitive touch became highly valuated by other artists of Russian Avant-garde times and that brought him to the first recognition at an exhibition in Moscow. 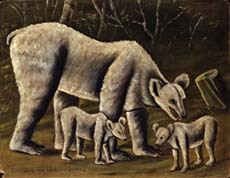 This exhibition now being held in Japan is unique in the sense that it presents works of the Georgean artist for the first time in this country.